great details and composition..sharpness is also wonderful. great capture!amazing sharpness and details.beautiful colors!very nice composition! Very nice capture. Great composition and details. great sharpness on this, got it lucky capturing a bird in mid flight with a meal in it's beak. 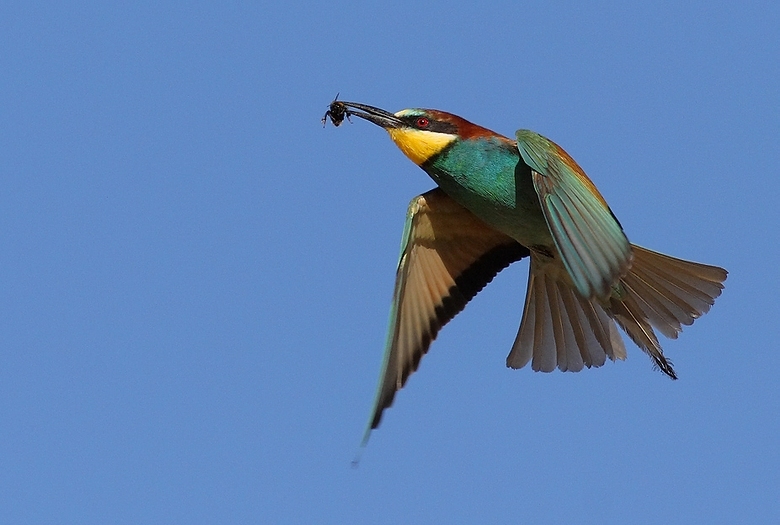 An in flight Bee-eater with a Bee (or something like that..something delicious;-). Great in flight capture of this very beautiful Bee Eater. The bird does stand out superbly against the steal blue sky. What a super shot! Excellent detail, sharpness and POV. The in-flights are not easy, especially of small birds. You've done wonderfully here. You could not get a sharper image of a bird in flight. And how exciting that he even has something in his beak. The colors are so rich and beautiful. A fantastic POV. An excellent photo. Your photo is a big catch! Superb sharpness and details. Fantastic clear colours. This Bee-eater stands out excellent against the beautiful blue sky. Great composition.